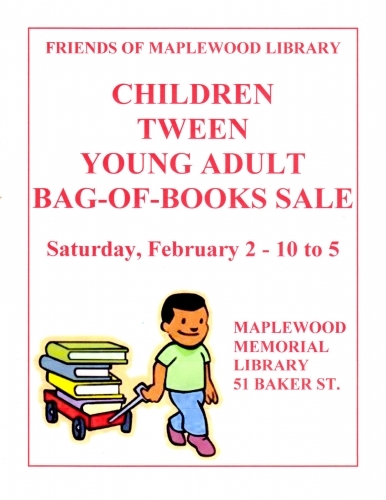 Children/Tween/Young Adult Bag-of-Books Sale, Saturday, February 2, 2019, from 10 to 5, Maplewood Memorial Library, 51 Baker Street, Maplewood, sponsored by the Friends of Maplewood Library. Large selection of books for children, tweens and young adults in beautiful condition. Fill a bag (provided by Friends) or buy books individually. Call 973-762-4136 for information.